Good Saturday morning everyone. I continue to monitor all the latest data and information regarding tomorrow nights snowfall potential. No real changes have occurred overnight, as an area of low pressure will bring rain during the day tomorrow followed by a changeover to snow tomorrow night. As it stands right now, we are still looking at around 1 inch or less. Some of the data is suggesting more; some is suggesting nothing. Therefore, I am splitting the difference and rolling with an inch or less. If the ground were below freezing, we would be looking at a little more, but we are going to initially lose a lot of the snow falling due to melting when it hits the ground. 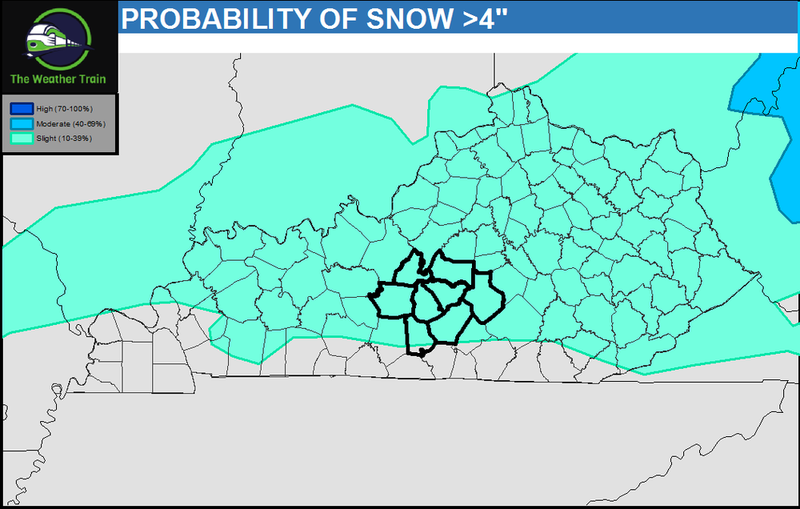 The map I have provided below shows what areas in Kentucky have the best potential for seeing snowfall accumulate. This is disappointing for snow-lovers, I know, but we're still 36 hours away, so there is time for things to change. Stay tuned!